Unlike the most recent Alberta provincial election, Patriot takes a very conservative choice when it comes to design. In fact, it looks just like the last SSD I reviewed, the Patriot Blaze. As it is from the same company, this is not too surprising. Thus, there are the same rounded corners and rough black exterior. Instead of the burgundy found on the Blaze, the Ignite opts for a red-orange color. The solid state drive's name is labeled in the same orientation as the Blaze, but with a different font. While the Blaze name on the drive was italicized, the Ignite's font is bolded. To the bottom of the drive is the size capacity, coming in at 480GB today. Just to note, only two capacities are available at press time, including 480GB and 960GB. Patriot's logo can also be found on the front label too, but the star-emblazoned "P" is also found near the capacity. This entire label is positioned in the middle of the drive rather than filling up the entire top. As I have mentioned on the first page, Patriot has a thing for fire, so the Ignite fits in perfectly with their other fiery-hot SSDs. According to the company, the Ignite weighs in at approximately 78.6 grams. This is the same weight as the Blaze, and is also quite a bit lighter than our past solid state drives, but you will see why when we inspect the internal components. Measuring at 100 mm x 69.85 mm x 7 mm, the Ignite is standard in the measurements. The 7mm thickness in particular will ensure compatibility with thinner laptops or ultrabooks. Flip over the Patriot Ignite, and you will see some standard information found on the backside of other SSDs. The Ignite's model number is printed here, with another reassurance in case people forgot the size of the internal capacity. Specifications and certification logos are also printed here, which is what we would expect. There is a warning on the label stating the voiding of warranty should you open up the enclosure, so be sure to heed the warning. Finally, the back side exposes the SATA 6Gb/s connector and the power connection. The Patriot Ignite 480GB heralds from Taiwan, going to prove not everything is made in mainland China. With the proximity and the close ties in the past between mainland China and Taiwan, I would excuse you if you thought otherwise. I will not get into politics, so we will move on to opening up the Ignite. 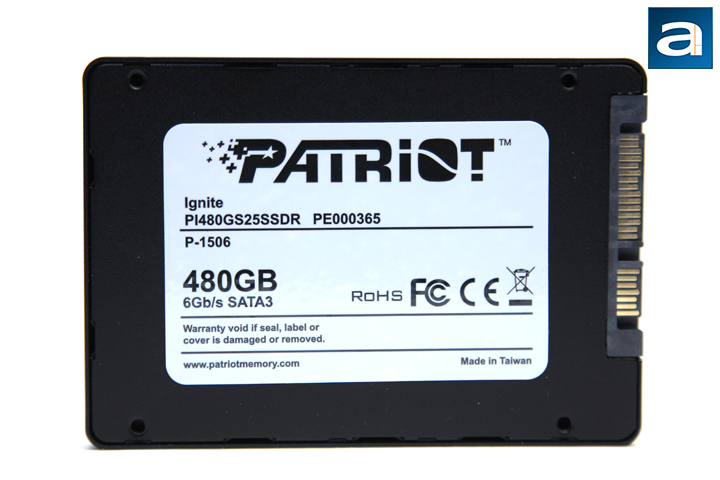 The Patriot Ignite 480GB has a separate top and bottom plate, but this is where the similarities between the Blaze and the Ignite stop. Rather than using screws to hold the two pieces together, Patriot has chosen to implement friction clips, which is similar to what we saw on the Crucial BX100 500GB, reviewed recently by Jonathan Kwan. This is one of the cost-cutting options employed by Patriot to reduce the material used. Even though this change may seem quite small, if you manufacture enough of these SSDs, the solution is justified. As I have mentioned in the past, please do not try to open the drive's enclosure. This will void your warranty, which is a standard three year warranty from Patriot. If you are curious, you can continue reading as we venture into the SSD itself. However, if you do feel inclined to open it up, you have been warned. Carrying on, I asked for some help from the Editor-in-Chief, and he pried apart the bottom and the top. Unlike a traditional HDD where you would find an actual spinning platter, all you will see is a small printed circuit board, littered with chips and embedded onto a blue piece of glass fiber laminate. Here you will also notice the board is half or two-thirds the size you would normally see in other solid state drives. Instead, you have a tightly knit configuration, with a Phison PS3110-S10 controller at the center of it all. 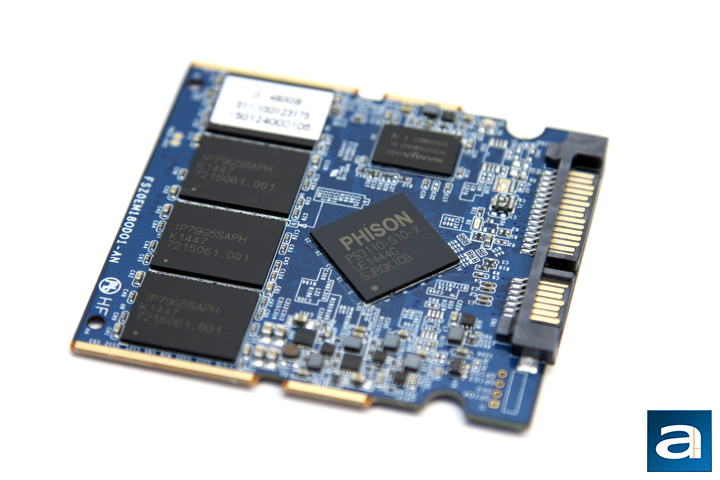 Phison is a Taiwanese manufacturer of NAND flash controllers, and has been doing so since the turn of the millennium. 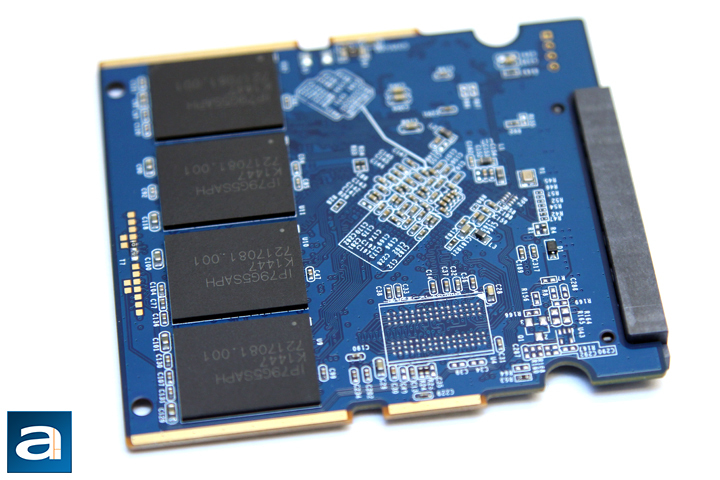 In the past, their main focus was non-SSD applications, such as USB flash memory. However, the Phison PS3110-S10 has gained popularity for providing performance at a relatively low cost. 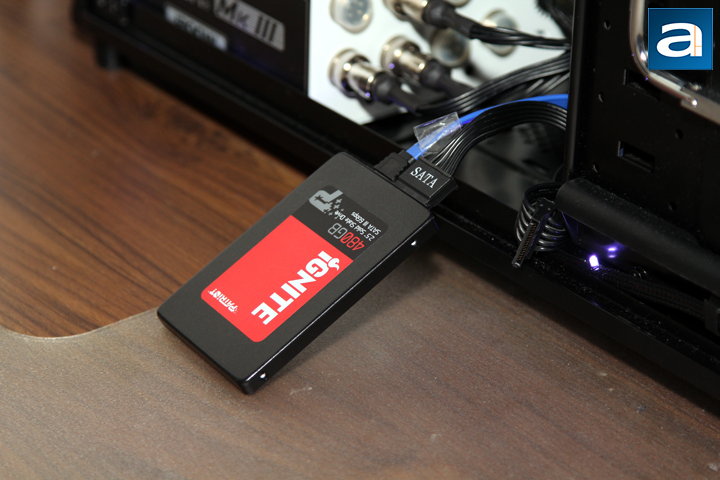 Other solid state drives with the PS3110-S10 inside include the Kingston HyperX Savage and Corsair Neutron XT. The Phison PS3110-S10 in the Patriot Ignite 480GB is an eight channel controller, with up to 32 chip-enables. This controller supports up to 1GB of DDR3 memory, with a built-in 120-bit ECC, or error correction codes. The controller is fabricated on a 55nm process. Otherwise, the controller also features End-to-End Data Path Protection, SmartECC, SmartFlush, GuaranteedFlush, and DEVSLP support. In addition, the drive comes with the standard TRIM and SMART compatibility. Paired with the mentioned controller are eight NAND flash chips from IM Flash Technologies, a semiconductor company founded in 2006 in collaboration with Intel and Micron. The four NAND chips are IMFT IP79G5SAPH asynchronous multi-level cells manufactured in a 16nm process. Once again, these are the exact same chips found in the Patriot Blaze 240GB, except this time with double the number of them for double the capacity. Thus, each chip carries a 64GB capacity, to make for a total of 512GB. Around 7% of the total capacity is meant for overprovisioning, so users only have access to 480GB. In Windows OS, you will find 447GB of accessible space. Write endurance information is not listed. Again, the exact same Nanya Technology memory chip, the NT5CC256M16CP-DI, is also found on the Ignite, and it holds the 512MB DDR3L RAM. This runs in DDR3-1600 at CAS latency timings of 11-11-11, and at a frequency of 800MHz. Overall, the whole package has a rated mean time between failure of 2 million hours, or 228 years. 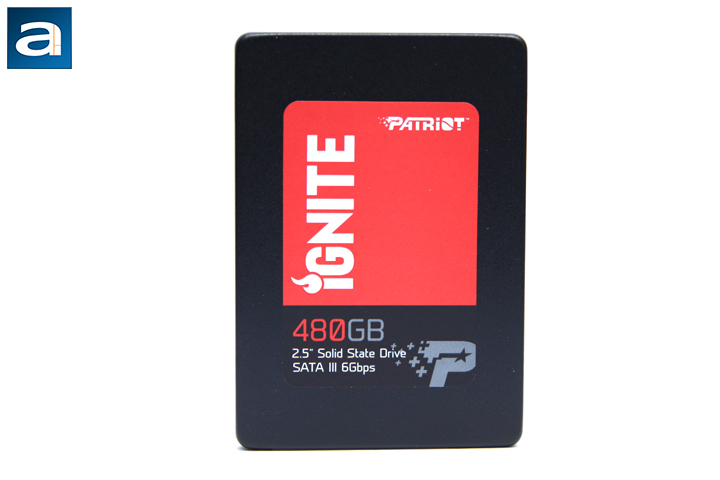 The Ignite 480GB, as mentioned before, is backed by a three year warranty from Patriot Memory, which is average across similarly priced drives.